Discover the ritual for normal to dry skin. This two-week introduction nourishes and hydrates skin for youthful radiance. Pure One Step Camellia Cleansing Oil - 25 ML | 0.8 FL. OZ. The Rice Polish: Classic - 10 G | 0.3 OZ. The Essence - 25 ML | 0.8 FL. OZ. The Silk Cream - 10 ML | .34 FL. OZ. Ideal for normal, combination/dry and dry skin. Non-comedogenic. Non-irritating. Non-sensitizing. Dermatologist tested. Cruelty-free. Begin with dry hands and face. Gently massage 3-5 pumps of Cleansing Oil onto face to melt away impurities. Rinse. Begin with wet hands and face. Pour 1/2 teaspoon of the Rice Polish into hands and rub together to create a creamy foam. Gently massage onto face for 15 seconds, avoiding the eye area. Rinse. Pour a palmful of The Essence into your hand, put your palms together and press gently into the skin on your face and neck. Gently massage a pearl-sized amount of The Silk Cream onto face, neck and décolletage in upward strokes. The Starter Ritual Set is rated 4.7 out of 5 by 68. Rated 5 out of 5 by Daniela from Where have you been ?! OMG Tatcha where have you been all my life!? I just purchased the Starter Ritual Set and my goodness I have never been more in love! How is it possible that after the FIRST time using it I already saw results. I have NEVER seen results from something so quick... first use! I’ve used the set for the past 2 nights and my old acne scars have already started to diminish.. a lot. My face is SO much smoother and brighter.. I am freaking out over here! I can’t stop looking in the mirror. After one day my acne scars are soooo much lighter.. how is this possible?! I need to meet face to face with whomever created Tatcha and give them a giant kiss! It is the BEST! Rated 5 out of 5 by Hui from Not sure what happened I think having starter kits shows how much confidence Tatcha has for its products, and rightfully so. I purchased the full-size set before I even finished with this one. After just one week my skin became brighter. I let my sister try the powder enzyme and she is hooked immediately. For my other concerns like acne, hyperpigmentation and expression lines, it took a bit of time but I do see improvements after a month. My skin only behaves when I am on medication. I am not sure what happened, Tatcha works. It sounds strange but I do look forward to the cleansing and moisturizing ritual every day. The scent, the aftermath, I would say it is totally worth the price. Rated 5 out of 5 by Anonymous from SAVED MY SKIN After trying a new foundation, my skin was so dry and falling off my face in chunks! Nothing I normally use was working. Finally I came across a video by Nicol Concilio recommending Tatcha, and I knew I needed to try this product. Within 3 uses my skin was back to normal, but better! My pores were smaller and most already completely gone! My acne scars even started fading! This starter kit has been lasting me now for a month. And I have just under half of everything left, except for the essence. If you are worried because you have acne prone skin, don't be! I have suffered from acne since high school and my skin has never looked and felt better! Tatcha is 1000000% worth the investment! Rated 5 out of 5 by Tina from Life changing kit ! I wanted this Tatcha kit to try for a long time but it is a bit expensive. 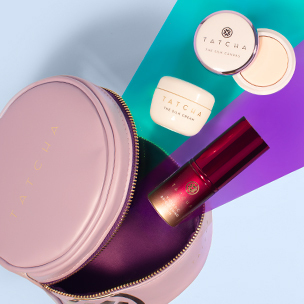 Everyone is raving about how amazing Tatcha's products are and that you have to try them. So after struggling with other creams and products cheap and expensive from other brands I gave this a try and I loveee it soooo much! My dry skin is refreshed, soft, glowing, I don't have any dry patches on my face anymore. The results were showing after just a few days of using this kit! 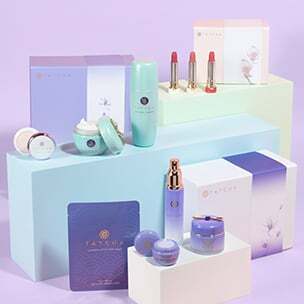 I will purchase more of Tatcha's products and this kit in full size, I don't care if it's expensive its worth the money! Rated 4 out of 5 by Anonymous from Eternal love I was so happy with this set, every product makes my skin glow. Oil-base cleanser smells very good and pure, no strong flavor, perfect even for oily skin. Powder - cool 2-in-1 product - cleanse and exfoliate at the same time. I wish this powder turn into foam more easily, it's hard to mix powder and water in right ratio. Essence is everything for skincare! Water cream... I can't say any pro or cons about this product, I wish more product in this set. Every product I've used for month and only water cream for 2 weeks. And, yes, I'm so crazy about package - it's just piece of art! Rated 5 out of 5 by Deb from I'm Hooked I recently purchased the starter kit for normal to dry skin. I am on Day 3 of using these 4 products and I don't have enough words to describe the difference in my skin in just three days. My skin is softer, more hydrated and plump and just looks and feels incredible. I will be purchasing full sizes of each of them as I get closer to running out of this initial kit. 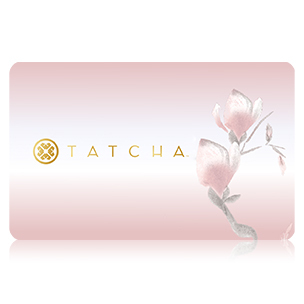 While pricey, I see Tatcha as being comparably priced or even a bit less expensive in some cases than other high quality skin care lines. My skin is aging, but taking care of it is very important to me no matter my age. Rated 5 out of 5 by Anonymous from Happy with the Results! Maybe I'm feeling maudlin but I remember my first pimple at eight years old, it only got worse through the years. I wore so much make up- without it people didn't recognize me. I had a job selling another brand of skincare, but I couldn't lie and tell people their concerns would be fixed. But with this, for the first time my skin is clear! I'm seeing such a difference, I don't even wear powder on dates. My skin is clear and pretty for the first time in forty years! I can even use some of the cream blushes without the expectant break out. So thank you for your technology that made it. It works, it does what it says it will and that is rare. I'm babbling, sorry I do that. Just wanted to say TATCHA makes good stuff and I am happy when I look in a mirror! Rated 5 out of 5 by Katie from Life changing!!! I’ve struggled with acne and acne scaring for the past i’d say 8 years. I’ve tried everything under the sun and spent tons on dermatologist prescribed products but nothing has helped me more than Tatcha. I’ve only been using it for about a month and people are telling me my skin looks clearer than it’s ever been! My redness is reduced dramatically and my skin is bright and dewy now. For best results stay consistent with use, I’m very inconsistent with washing my face and even i’ve seen results so i’m sure if you are using this product every day you will see even bigger changes more quickly!! Thanks Tatcha for making me more confident in my skin again! When the starter ritual sets are empty can they be refilled for &nbsp;future vacations or do we need to purchase another starter kit? Great question! Most travel-size items in our collection are refillable by purchasing full-size versions. How long does the ritual take? Tatcha&rsquo;s skincare philosophy is one of simplicity and effortlessness. The entire ritual can be completed in 3 minutes. I have sensitive skin with a little rosacea on my cheeks. I tried so many other lines and nothing seems to work as my skin is also very dry in the winter. Should I start with the sensitive ritual set or is there anything else I should i try? Thank you for your question! For all skin types that also have rosacea, we would recommend using the items in our Starter Ritual for Sensitive Skin both day and night. This set contains essential ingredients such as indigo extract, colloidal oatmeal and sophora japonica extract, which calm redness and inflammation and restore skin's natural resiliency. We hope this helps! When are you planning to restock the starter ritual for sensitive skin?I wan to know thank you. Hello Jolina! We are working hard to bring this starter ritual back to our collection. Please sign up for the waitlist so we can notify you as soon as it arrives. Thank you for your patience!